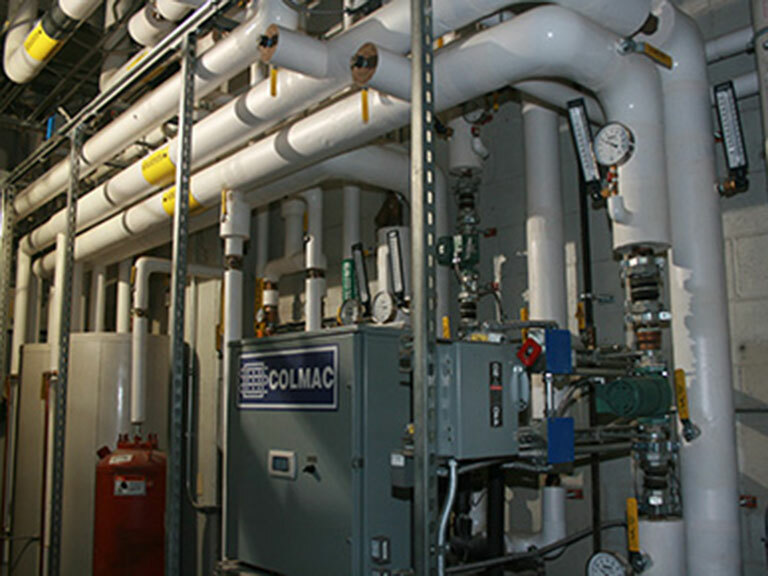 ABM Mechanical Inc. can design, install and maintain all types of commercial geothermal systems such as vertical closed loop, horizontal closed loop, pond or lake closed loop and well-to-well open loop systems. 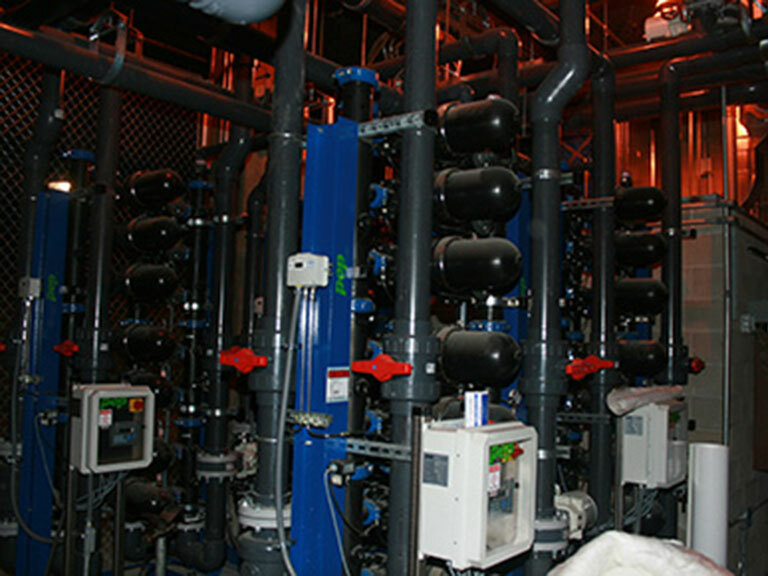 With components such as geothermal heat pumps, ground source heat pumps, direct exchange heat pumps and heat exchangers, geothermal piping systems, pumps, valves, and wells for industries such as hospital and healthcare, college and university, laboratory and medical research, aquaculture, retail, multi-unit housing, as well as industrial and government. Geothermal energy is defined as heat contained within the Earth. The upper layer of the earth’s soil maintains a relatively constant temperature despite the season. The temperature of the ground is warmer than the outside air during the winter months and cooler during the summer months. A geothermal heat pump is able to use this temperature difference to provide essentially free heating and cooling. Typical geothermal systems utilize the upper layer of the earth’s soil as a heat exchanger. In geothermal terms this heat exchanger is called a bore field loop, or a system of pipes buried in the shallow earth. A fluid is circulated through this loop to provide a method of heat transfer, either to reject heat during summer cooling mode or to draw heat in during winter heating mode. A geothermal system does not create the energy used for heating or cooling as in a conventional system but simply provides a method of transferring this energy in a useful manner from the ground to the system. Because of this feature, a geothermal system is much less expensive to operate than a conventional heating or cooling system. Roughly 75% of geothermal energy is free and therefore a system can see a simple payback of capital costs in less than 5 years. Geothermal equipment is installed indoors. This improves longevity of equipment and provides a safe environment for maintenance staff. Workers are not exposed to the dangers of servicing equipment on rooftops. Because combustion is eliminated, there is no production of carbon monoxide from a geothermal system. Multi-stage units that do not overheat or overcool provide a very consistent temperature throughout the building. 100% dehumidification can be added to most systems, fanspeed dehum control is built in to all units with ECM fan motors. Both systems provide the client with optimum humidity control and increased comfort. These systems are easily matched to energy recovery ventilation for efficient use of fresh outdoor air. Classroom units have energy recovery built-in. Most systems can be tied directly to any fresh air ventilation system when energy recovery is utilitzed. Classroom units have built in ERV heatwheels. Fresh air is controlled through an internal CO2 and occupancy sensor for optimum efficiency. Building owners can now showcase their commitment to environmental responsibility through the use of sustainable and renewable energy. ABM Mechanical, Inc. can assist you with delivering that message to the local community. No outdoor condensing units or cooling towers on roof or ground provide architectural freedom and less structural concerns from weight of roof-top equipment. 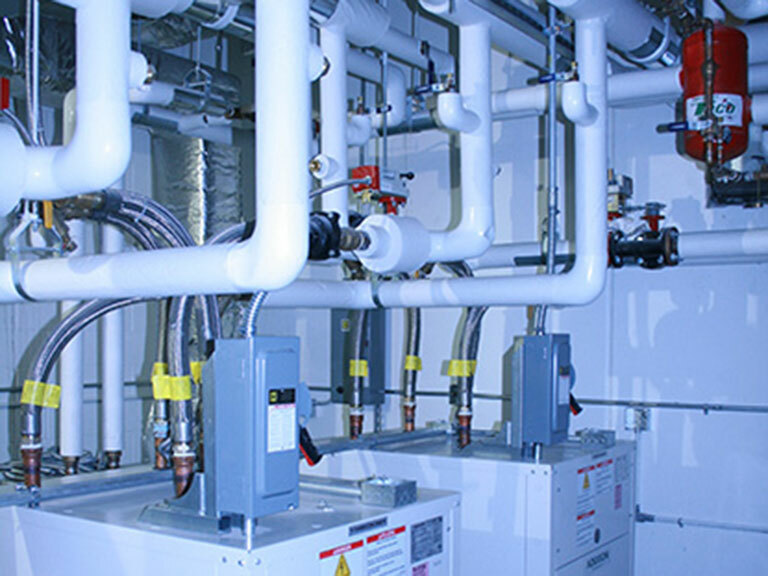 Geothermal heat pumps produce no GHG emissions on site. Due to the high efficiency and reduced use of electricity, geothermal heat pumps also produce less GHG emissions from offsite sources. A corporation spends $1,000,000 to install a geothermal heat pump system in its new office building. They moved into the building during the 4th quarter of 2010. The corporation is in a 40% tax bracket when state income tax is included. Click here to download the O'Connor General Motors Dealership case study.